Do we need to be Mennonite to participate? Not at all. The choir over the years has always had young singers from a wide variety of denominations. 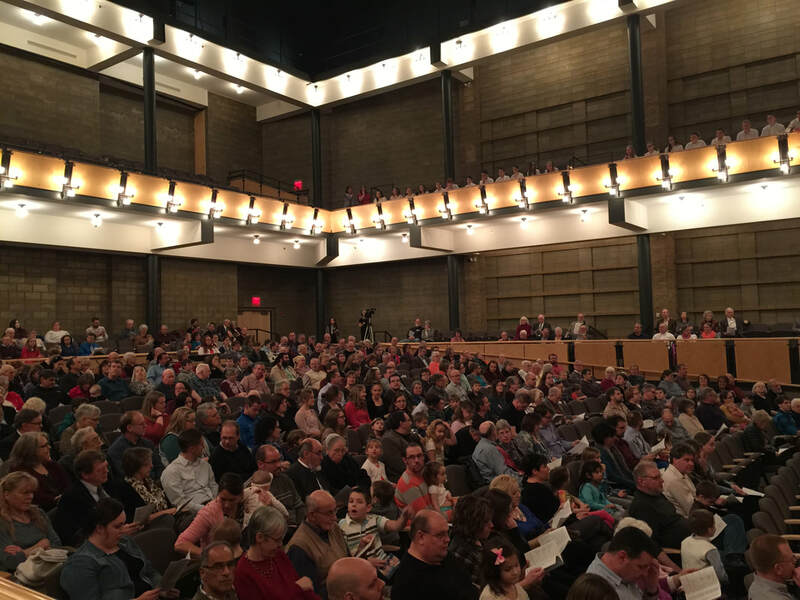 The festival continues to reflect the qualities and musical sensibilities valued by and heard in many Mennonite churches in their traditional four-part congregational singing. But like “Amish cheese” or “Amish furniture” we see this heritage as a gift to the wider world. Everyone in grades 3 through 9 is invited and welcome to be part of the festival. How much does it cost for my child to participate? It costs $35 per child to register and you can do it online. Because this includes the choral costs as well as the expenses for the Saturday lunch and using the campus recreation center, the registration fee is a fraction of the actual per-singer cost of the festival. For this reason we charge the same amount per child even if from the same family. Contact any one of the committee members in the Contacts tab above if sending an additional child or children in your family is prohibitive. We’ll reduce the fees. Confidentiality will be observed. For the concert on Sunday afternoon, each child needs to wear a white shirt or blouse and solid black or navy blue slacks or skirt (skirts should be at the knee or longer). We ask that there be no high heeled shoes for the girls and that the boys wear black or dark shoes. For Saturday practice, the children should wear comfortable casual clothes and shoes. Where do most of the children come from? 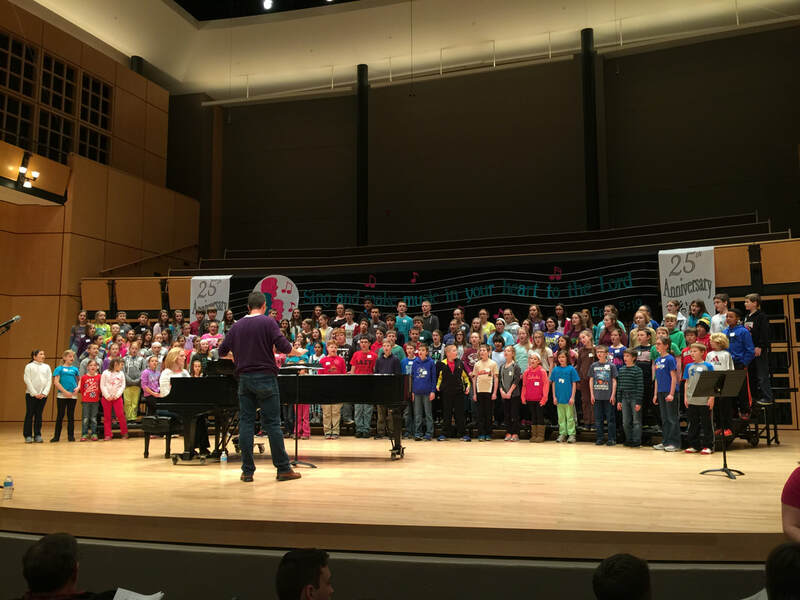 The largest group comes from northern Indiana, but each year a significant and growing number of the singers hail from Illinois, Ohio, Michigan, and more distant parts of Indiana. A group from Lombard, Illinois, travels 130 miles to be at the festival, and a group from Pigeon, Michigan, drive 4-and-a-half hours (270 miles). Close to 50 different congregations and organizations are represented by the singers. What about lodging if we are from out of state or not from the Goshen area? If you come as a group from a distance and would like lodging at a church building, just let us know and we will make these arrangements. If you come as a family unit and prefer to be in a home, we will make this arrangement. If you prefer a motel, there are numerous options in and around Goshen, Indiana, that your group leader can make. Contact us to request lodging assistance. Your child will have a pizza lunch and healthy finger snacks during the practice day on Saturday (Included in the registration fee). Make a note on your registration if your child has any food allergies the staff needs to be aware of. What ages can be part of the festival? Anyone in grades 3 through 9. 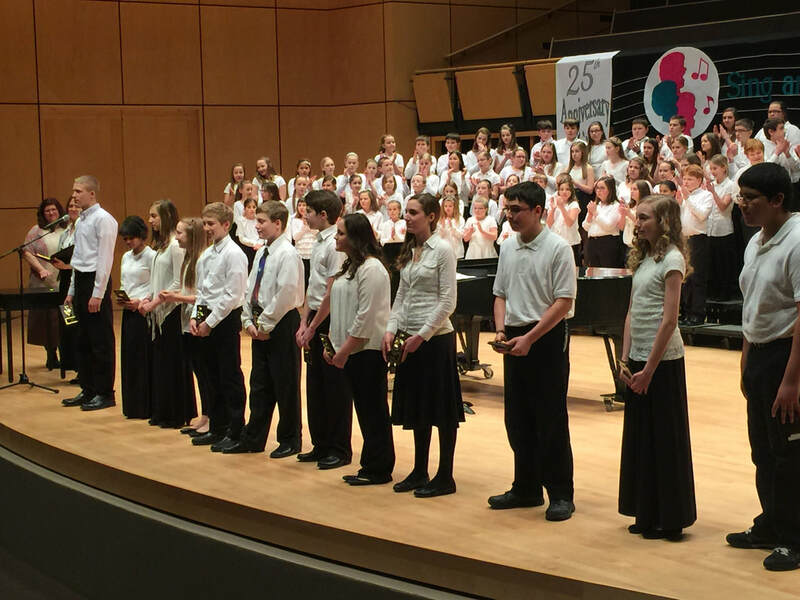 The singers will be part of a combined choir of all those grades as well as part of either the younger choir (grades 3 through 5) or the older choir (grades 6-9). How many years of participation does a child need to earn a recognition award? When a child participates in three festivals, the child receives a certificate of recognition. With six total years, the child (now a young teen) receives a plaque. We also award a seven year key chain. These are presented during the Sunday afternoon concert. Participation in the festival does not need to be consecutive. A child that misses one year can still earn the six-year plaque since there are seven possible years to attend the festival (3rd through 9th grade). How much does it cost for family and friends to attend the final concert? The concert on Sunday at 2 p.m. is free and open to the public. A free-will offering will be taken at intermission. 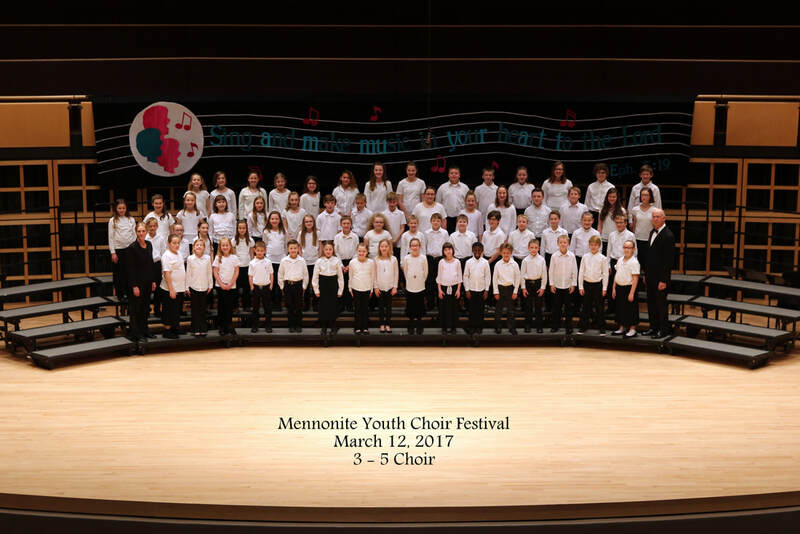 If you want to write a check beforehand, it can be made out to Mennonite Youth Choir Festival. Contributions are tax deductible. What time do I drop off my child on SATURDAY morning and pick up in the afternoon? The Saturday practice on Festival weekend is designed to work for both the children and the parents/adults dropping them off. 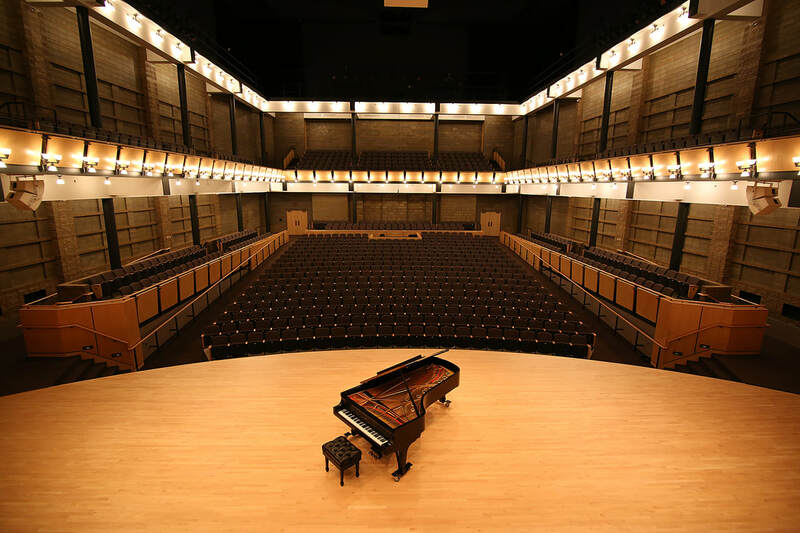 Singers for both choirs should be signed in at the Goshen College Music Center (Sauder Hall) between 9 and 9:15 a.m. Plan to pick them up between at 4:15 in the afternoon. We’ll take good care of them and give them lunch, so enjoy the day doing whatever you please between 9 a.m. and 4:15 p.m. We can always use volunteers if your schedule allows. What time do I drop off and pick up my child on SUNDAY for the concert? Your child needs to be dropped off by 12:45 on Sunday afternoon. Pictures begin at 1:00. Please be prompt or a bit early so your child won’t be left out of the photo! The concert begins at 2:00 p.m.
What specifically will my child do Saturday morning and afternoon of Festival Weekend? The Saturday schedule includes rehearsal with each individual choir (the grades 3-5 choir and the grades 6-9 choir), a snack, a pizza lunch with finger veggies, rehearsal with the combined choirs, and strategically planned breaks and an activity time. Any tips for helping my son get excited about being part of the festival? Yes. Try this truly inspiring classic Disney movie (“Almost Angels”), which casts the actual members of the Vienna Boys Choir on a fun tour of the United States. My child has a special physical or emotional need–how can I communicate that to the festival planners? We welcome your child and want to know about the child’s needs so we can be of help in making this a positive experience. Contact us before the festival. Are there any available practices my child can be part of BEFORE the festival weekend? Yes. These are optional, but many families near the Goshen area–and some from a further distance–choose to have their children participate in them. These are listed under Schedule. How will my child learn the music? Can choir groups come to the festival and have a chance to perform as a group? We welcome you to bring your choir to the festival, but the vision of this festival is different from other choral festivals that have choirs performing individually as distinct choirs. 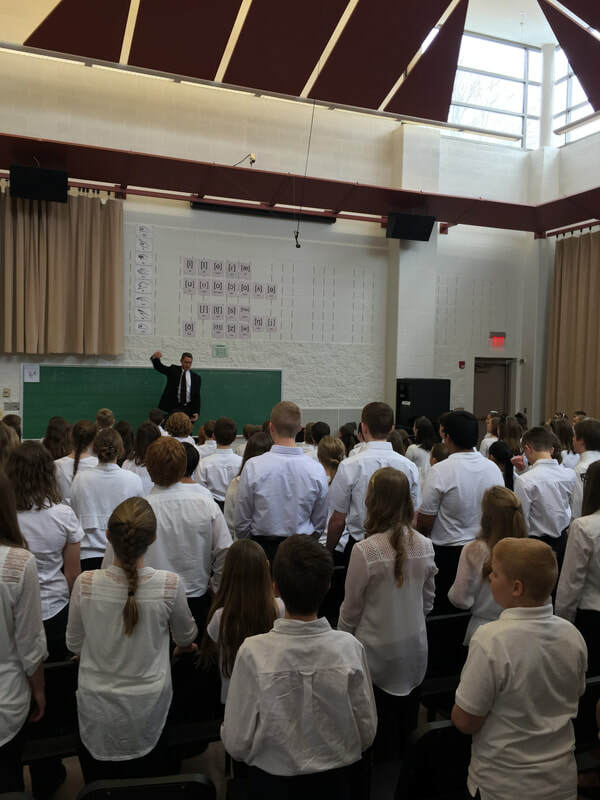 All the children and teens in the Mennonite Youth Choir Festival blend together to form a choir (a grades 3-5 choir and a 6-9 choir and then the two groups combined for a number of songs). No groups within the larger choir perform separately. All children participate equally. Do you need volunteer help with the festival? Yes! We need volunteers for meal preparation and serving, overseeing the activity time for both choir groups in the recreation center, serving on the planning committee for the festival, assisting youth during the concert with moving from stage to concert seats, and for ushering at the concert on Sunday afternoon. If you would be willing to take on one or more of these roles, please contact Lora Aldrich on our committee. We’d be very grateful! Another way to help is to connect individual families and congregations with the festival by giving a committee member the name of a person who might be willing to distribute literature about the event and become a contact person for the festival committee. Does the festival make a profit? We are a non-profit organization run by a volunteer group of committee members who donate all of their time and travel expenses to make this happen. Funds received go directly to the immediate costs of hosting the festival. Donations are appreciated. How can I donate toward the expenses of the festival? 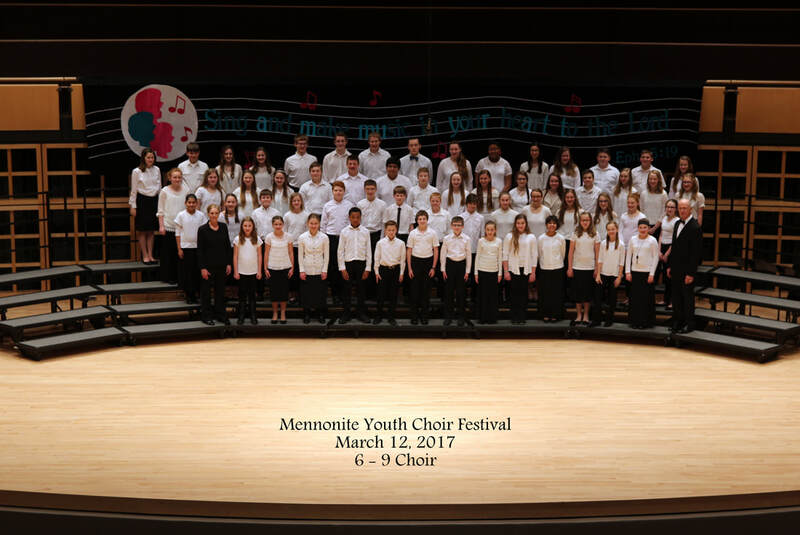 Donations can be made out to the Mennonite Youth Choir Festival and sent to ﻿Lisa Keim 243 N. Bay Port Rd. Bay Port, MI 48720. We promise to make efficient and effective use of the donation toward the festival’s stated mission goals. Thank you for your contribution toward this initiative and to the lives of the young people who are part of the festival. Turn east at College Ave. Turn south on 12th street. The Music Center is on the right. Turn west at College Ave. Thank you to all the volunteers who help with the festival each year. 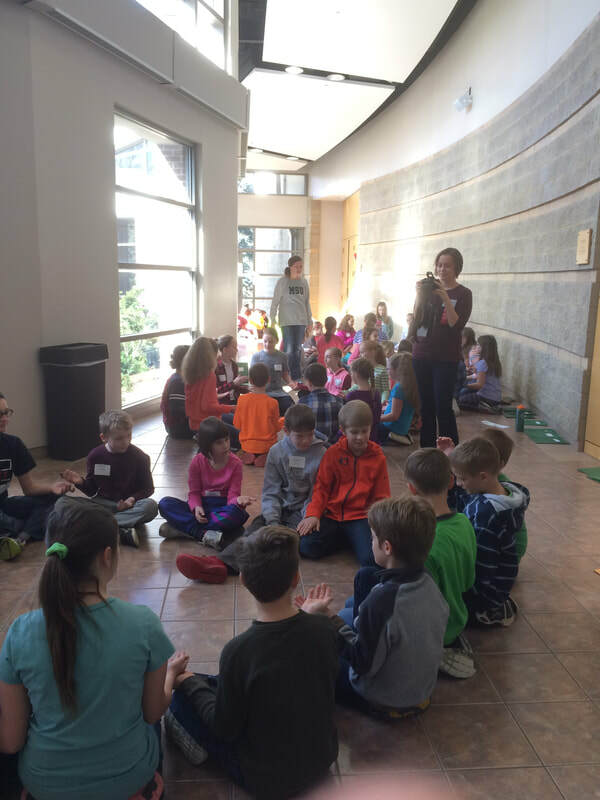 This is a great opportunity for our children to learn sacred music and the love of singing. This festival wouldn't be possible without all of you.